Our Quad 470 Pack comes with two 470ml bottles of our Kryptonite Cannabis Extractor Cleaner and two 470ml bottled of our Kryptonite Naked glass and bong cleaner. All of these bottles are equipped with our newly designed bottles with an easy pop-top applicator. The Quad 470 pack is only available to customers in the United States. Why order 2 when you can get 4 with FREE shipping? Kryptonite Quad 470 Pack gets you our 2 newest products delivered fast and free of charge! The most powerful and effective environmentally safe cannabis accessory and grow cleaner available on the market today! Our newly engineered Kryptonite Cannabis Extractor Cleaner was designed specifically for professional cannabis growers, extractor artisans, and true connoisseurs of clean cannabis concentrates in mind. Kryptonite Extractor was designed and engineered in a lab to be the most effective cleaner to remove cannabis plant matter, waxes, and cannabis concentrate extracts available today. 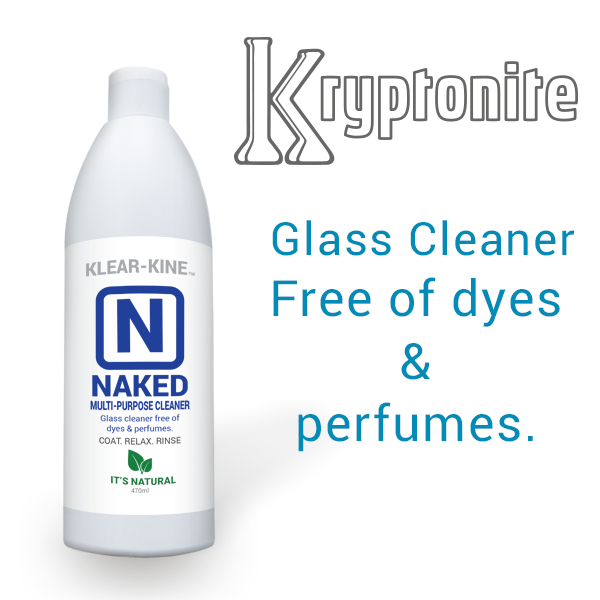 Expanding the Klear family with our newest formulation, our Kryptonite Naked glass and bong cleaner contains no added colors and no added fragrances. It truly is the best 420 and 710 cannabis accessory cleaning solution that coats all those hard to reach places including percolators, down stems, and your most delicate heady glass. 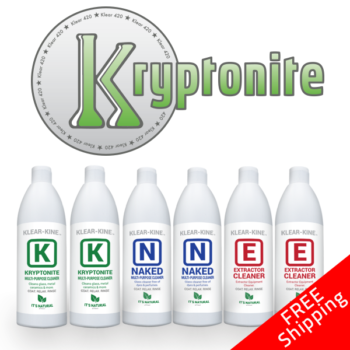 Kryptonite Naked is a clay-based glass and bong cleaner and contains no salt, alcohol, acetone or other harsh abrasives. Why Buy Klear Kryptonite Naked Bong Cleaner? Klear Kryptonite Naked Bong Cleaner is the first and only shake-free, color free and fragrance-free multi-surface glass and bong cleaner on the market! Klear Kryptonite is the only nationally available glass and bong cleaner engineered and tested specifically for smoking cannabis and cleaning cannabis accessories smoking. It’s safe to use on glass, metal, hands, sinks, tools, extraction tubes and clothing. 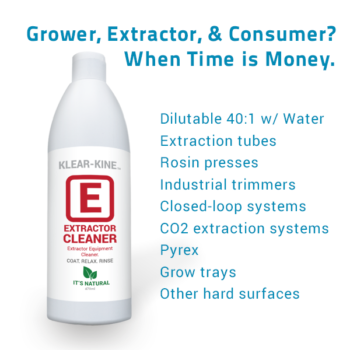 In addition, our new Kryptonite Cannabis Extractor Cleaner was specifically developed for cannabis growers and cannabis extractors. It easily cleans your tools, grow trays and other hard glass and metal surfaces. Need more than one bottle of our Kryptonite Naked Bong Cleaner? Check out our Naked Super Pack or Naked Half Case and save big!